Impact Wrestling has announced a tag match with Pentagon Jr. & Fenix vs. 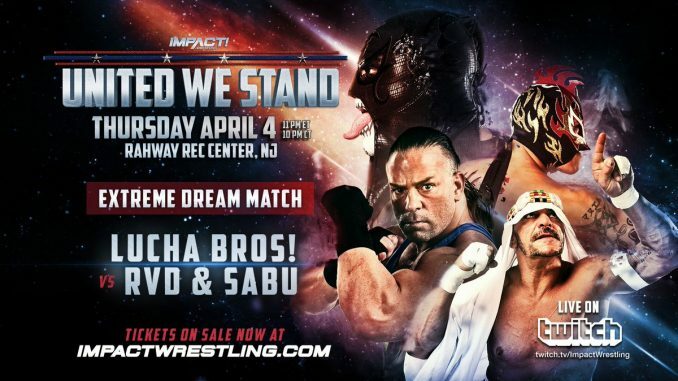 Rob Van Dam & Sabu will take place at "United We Stand" during WrestleMania week. Impact Wrestling has announced a tag match for “United We Stand”, which is their card during WrestleMania week. Pentagon Jr. and Fenix will take on Rob Van Dam and Sabu on the card from Rahway, New Jersey on Thursday, April 4th. The event will start at 11 pm Eastern and stream live on Impact’s Twitch channel. Pentagon and Fenix are currently advertised for three shows that night with MLW at 7 pm at the Melrose Ballroom, the WrestleCon Supershow at the Hilton New York Midtown Ballroom that also starts at 7 pm, and the Impact card that begins at 11 pm in Rahway. This will mark Van Dam and Sabu’s first matches with Impact / TNA since 2013 and 2010 respectively.